No, I didn't mess up and post this on the wrong blog. The water deer, Hydropotes inermis, is quite deserving of a place here. 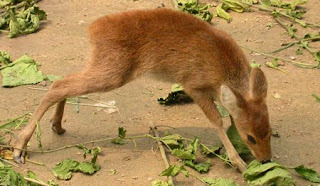 It lives in China and Korea, in swampy regions and grasslands, where it follows a normal, deerish vegetarian lifestyle. It also has three inch fangs. Unfortunately for your nightmares, that is not a Photoshop, just a picture of a healthy male deer. Those giant teeth are used during mating season, when male deer fight each other for females' affections. Now, try and imagine what Bambi would have been like with one of these starring. 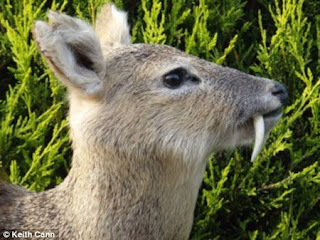 Fanged deer. I don't know what to say. I used to raise Munt Jac deer. Those males also have fangs, only they're about two inches long. My daughter also has a 4 inch scar on her thigh from one of them. Normally they're pretty docile though. Looks like saber-toothed herbivores have evolved before.